Ok, I know I’m opening pandora’s pickle box by doing this, but as an extremely excited first time grandparent, we just had to show off our family’s newest pickleball player. Brandon Hunter Grubbs was born December 29th to our oldest son Joshua and super wife Abby. They reside in Fort Wayne, Indiana and love pickleball. Brandon was a whopping 5lbs 4oz and 17 inches long. He is doing great! So now everyone will want to show off their little picklers too. 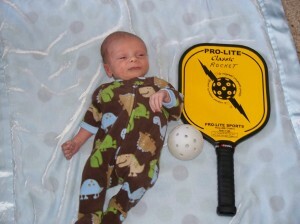 But that is absolutely ok.
Feel free to comment on this post with your newest pickleball player. Or if you want to post a bunch of pictures of your mini pickleballer, you can do so at our sister blog PickleballNation.com .